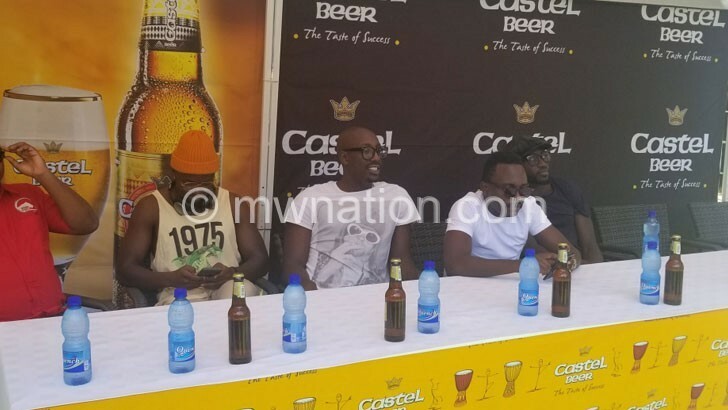 Kenyan Afro pop band, Sauti Sol has arrived in the country ahead of the official launch of Castel Beer. Dubbed the African Print Party, the launch will take place on Friday at Sunbird Capital Hotel in Lilongwe. Speaking at a press conference upon arrival, the music group said Malawians should expect more than the two previous shows at Lake of Stars last year and the maiden trip in 2013. “The expectation is massive and it’s always amazing performing here,” said vocalist, Savara Mudigi. Castel Malawi’s Category Manager, Twikale Chirwa (left) together with members of Sauti Sol, (from left yo right) Savara Mudigi, Bien-Aime Baraza, Willis Chimano and Polycarp Otieno. Chalamanda, the Urban Dance Crew with Patience Namadingo as the host. Castel Malawi’s Category Manager Twikale Chirwa says the show is about giving local consumers some experience. “Castel is one of the premium beers in Africa which is also about Arts and Afrocentric platform same with Sauti Sol and local acts like Edgar and Davis,” he said. Other Sauti Sol members are vocalist, Willis Chimano and guitarist, Polycarp Otieno. Some of the award-winning band’s popular songs are Isabella, Short N Sweet, Afrikan Star, Africa, Unconditionally Bae, Sura Yako and the hit of the moment, Melanin.